WHEN COMMUNICATION Arts junior Chelsea Blanco was asked to rate the effectiveness of St. Raymund de Peñafort building as her learning hub for the past three years, she settled with a score of five over ten. Blanco expected that the facilities in the University of Santo Tomas, as one of the top notch universities in the country, would be of high quality but what she was met with only disappointed her. Built in 1955, St. Raymund’s has been home to the Faculty of Arts and Letters (AB) since the merger of the Faculty of Philosophy and Letters and the College of Liberal Arts in 1964. Artlets have been sharing the building with the students of the College of Commerce and Business Administration (Commerce), who occupy the third to fifth floors. Withstanding 53 years, the building has been a witness to history, changes, generations of students and faculty members, and population growth. As paradigm shifts occur along with the globalization of technology, conduciveness of a place to learning, especially in terms of facilities, has become a crucial indicator in providing quality education. How does AB cope with the challenges of physical deterioration and emerging innovations in providing high standards of education? Aside from the rooms at the first and second floors of St. Raymund’s, AB also used some rooms at the Main Building and San Martin De Porres building during this period. Tabirara, who was a student during the 1960s, recalled that the functions of rooms then were different from their present uses since some rooms once operated as a canteen, a library, and a waiting area. Over the years, St. Raymund’s has undergone various transformations to maximize the use of space. When the Miguel de Benavides library opened in 1989, AB modified its own library as regular classrooms–presently the rooms 117 and 119. The expansion of degree programs in the Faculty resulted in a surge in student population. Fortunately, the construction of new facilities and vacancies of other buildings inside the University aided to decongest the halls of St. Raymund’s. AB posted almost 40 percent growth of student population in 15 years. The total number of students from the academic year 2000 to 2001 to school year 2015 to 2016 surged from 2,934 to 4,871. In 2011, the Rizal Conference Hall, then a small auditorium for lectures, theater performances, and events, was modified into convertible classrooms. The completion of the Buenaventura Garcia Paredes, O.P. (BGPOP) Building in 2014 allowed classes to be held for junior and senior Artlets with 14 available classrooms at its 10th and 11th floors. “Naging mas comfortable ‘yung scheduling. There were spare rooms [in AB] for special classes, for petition classes, and sometimes classes for certain student events,” Tabirara said. This paved the way for the Faculty to convert some rooms in St. Raymund’s as a computer laboratory, ELEAP room, and an accreditation room. However, the establishment of the Senior High School (SHS) department last year forced Artlets to move out of BGPOP after two years of occupancy, prompting AB to borrow classrooms from the Tan Yan Kee Student Center (TYK) and the Thomas Aquinas Research Complex (TARC) for the academic year 2016 to 2017. St. Raymund’s is currently housing about 6,000 students from AB, Commerce, and now SHS. Offering 12 programs, AB alone uses 25 of its 30 classrooms with 69 sections and 16 petition classes. The remaining five classrooms of AB are lent to the SHS Humanities and Social Sciences Strand population. AB, likewise, holds some classes at rooms 316, 407, 411 and room D of St. Raymund’s; rooms 401 and 403 of TYK; and room 308 of TARC. “We found the need for additional rooms to adjust for the needs of the schedule kasi you have to make the schedule also convenient for the students,” Tabirara said. Only 30 freshmen sections will be accommodated for the academic year 2018 to 2019, as per the advice of Dean Michael Anthony Vasco, the assistant dean also said. 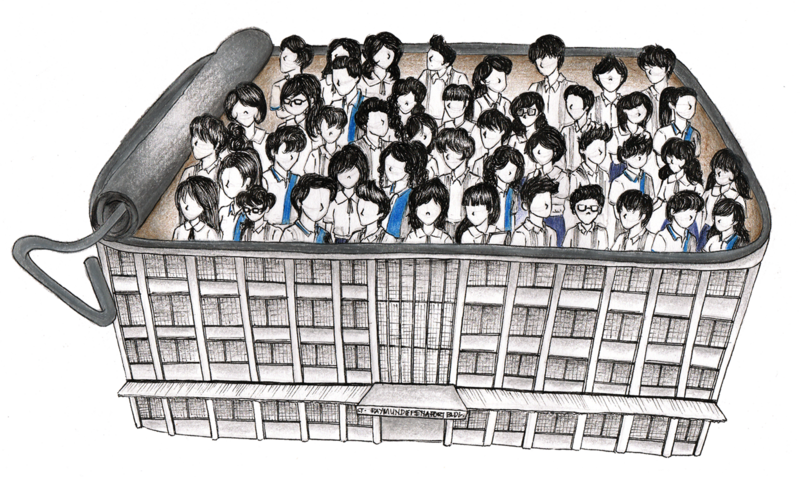 With limitations arising, especially in facilities, the number of students being admitted every year in the Faculty is pivotal in managing the ideal classroom size. In the changing landscape of classroom setting in the 21st century, shifting learning models, technological advancement, and state-of-the-art facilities are introduced to enhance the level of education. Designed to globalize education, the Outcome-based Education (OBE) curriculum is geared toward student-centered learning. To comply with this curriculum, Alfredo M. Velayo-College of Accountancy Assistant Dean Christopher German echoed Tabirara with the need to regulate the number of students per class. As compliance to OBE and the Commission on Higher Education’s (CHED) guidelines, Aseron shared that the College has a 1:10 faculty to student ratio. In response to this, the College of Science introduced the Science Online Learning Environment (SOLE) room, a smart classroom intended for student-centered learning. Ramos said all classrooms would eventually be converted into SOLE rooms. Innovations like this, however, are not viable for the College of Fine Arts and Design (CFAD) due to lack of physical facility, Dean Mary Christie Que pointed out. Que emphasized that despite CFAD’s small population, the college needs its exclusive learning hub, citing that Art students in foreign universities have their exclusive workshops to practice their crafts. “Wala kasi kaming enough space so […] we let the students do it [elsewhere] and then they submit,” the CFAD dean said. Faculty of Engineering Assistant Dean Rhoderick Asis, who said the Faculty had already exhausted its capacity, admitted the need for an exclusive building for laboratories which are the norm in foreign universities. Shortcomings, however, are cushioned by various colleges employing different strategies to lessen the compromise it entails. Assuring that there is no shortage of classrooms in the College of Accountancy, German said population projections for the first term are anticipated as early as February, since the building of the college can only house 94 sections, approximately 4,230 students, with 31 classrooms. In Engineering, some classes are divided to lessen the burden of a one-student-per-equipment ratio in laboratory classes, Asis said. Asis added that the Faculty of Engineering is updated when it comes to laboratory equipment, but addressed the lack of place to put their equipment strategically with their limited space. During a certain semester, the Faculty paid for the usage of some rooms at the Albertus Magnus building just to cater to its growing population, the Engineering assistant dean recalled. Commerce Dean Leonardo Canoy acknowledged the link among student population, available facilities, and the College’s manpower to achieve a “balance” so no shortage in classroom facilities will be experienced. “Actually, we tried to squeeze (the schedules). Usually, Commerce has classes from Monday to Saturday. What I did is ‘yung time namin, binago namin. The usual one hour (class), ginawa naming one and a half,” Canoy said.